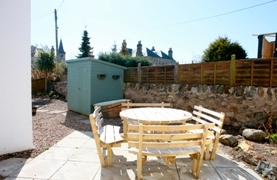 Golf Cottage Elie self catering cottage in Elie, Fife, Scotland. Golf Cottage is a charming detached Victorian cottage providing spacious, bright accommodation for eight people on two levels. The property is tucked away and sits within its own private fully-bound walled gardens which, in the summer time, get the sun all day. The East Neuk of Fife in Scotland enjoys a micro climate and therefore is one of Scotland's driest locations. Elie which has been described as one of Scotland's "best kept secrets" is only 10 miles from St Andrews and an hour from Edinburgh. Golf Cottage is conveniently located for golf courses, two of which are just next to the property. Several famous links golf courses are close by, and the championship course at St Andrews is only 10 miles away. Many other activities - including horse-riding, cycling, climbing, abseiling, sailing, windsurfing, water-skiing and diving - are also available in the local area. The cottage is also perfectly situated for a seaside holiday, being only a two minute walk to the lovely stretch of the golden sandy Elie Beach, and a 4 minute walk to the award-winning blue flag beach by the harbour. There are numerous pubs and restaurants to suit all budgets in the local area, and the 19th Hole, a family friendly pub with delicious home-made food, is just next door. Local shops, including a baker, delicatessan, pharmacy and gift shops, are within walking distance, the area is ideal for walking and cycling or just relaxing in this secluded location. The downstairs accommodation comprises an entrance vestibule with a traditional mosaic tiled floor, a reception hall, and a living room with cornice work and a bay window. 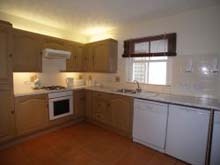 There is also a dining room with a timber staircase, a fully fitted kitchen, one double bedroom, one twin bedroom and a family bathroom with bath and shower. The staircase from the dining room gives access to the upper level where the two further twin bedrooms and shower room are situated. Outside, the property has its own secure walled garden which, in the summer time, gets the sun all day. Dogs can sleep in the kitchen or in the outside kennel. Bed linen and towels; heating and lighting; board games, cards and books. Change-over day and check-in times are variable. 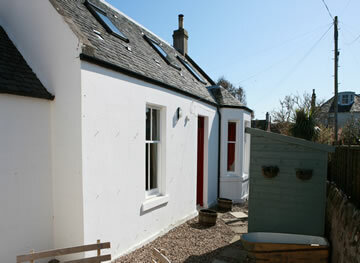 Golf Cottage, Links Road, Earlsferry, Elie, Fife KY9 1AW, Scotland, UK.